The Freshwater Center was established in 2001 as the result of a successful capital campaign. The Freshwater Center is a lasting home for water resource protection in Northern Michigan. Our office at 426 Bay Street in Petoskey, includes space for staff, a water resource library, a room for water resource educational displays, a volunteer work room, a conference room, and educational stormwater runoff treatment systems which are available to the public. We all know that "Seeing is Believing"
One of the most serious threats facing Northern Michigan waters is polluted stormwater runoff. Our downtown office site provides an excellent example of how to control and treat stormwater so it doesn't carry pollutants to our beloved waters. Come stroll through our rain garden and view the amazing native plants that add color and a sense of nature to our downtown location. The permeable paves near the front door allow you to see first hand how attractive controlling stormwater on your own property can be. Come visit the Freshwater Center any time! Our educational signage offers you a self-guided opportunity to learn more about controlling stormwater runoff. Located central to the Tip of the Mitt Watershed Council's primary service area of Antrim, Charlevoix, Cheboygan, and Emmet Counties, the Freshwater Center's downtown Petoskey office provides an efficient work environment. But this property is more than an effective office. Its very existence protects water quality. The property has been renovated in a way that collects and treats rainfall and snowmelt that would otherwise carry sediment, salt, oil, and other pollutants to Lake Michigan. 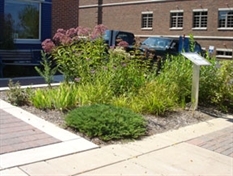 The innovative new parking lot and functional landscaping demonstrates state-of-the art methods to protect water quality from stormwater runoff. The Freshwater Center also is an important community asset. Educational displays and access to the Watershed Council's water resource library helps visitors deepen their knowledge. Meeting rooms provide a place to foster community dialogue about environmental protection. Where does rain or water from snow go? Lawns and gardens absorb some of it, but water can't soak into driveways, sidewalks, rooftops, and other hard surfaces (also called impervious surfaces). When stormwater runoff flows over roads, sidewalks, lawns, and gardens, it picks up substances like dirt, fertilizers, oil, salt, and bacteria. Additional pollution comes from nutrients used in fertilizers applied to lawns and gardens, as well as pet waste, and sediments from soil particles that are washed away from bare spots in lawns and gardens, roadways, and other areas of exposed soils. 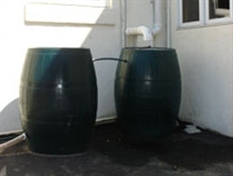 Stormwater can also contain other pollutants such as toxins and heavy metals. Most stormwater runoff washes into nearby water bodies carrying these pollutants from the places where we live and work into lakes and streams. Reducing stormwater pollution is one of the primary goals of Tip of the Mitt Watershed Council. 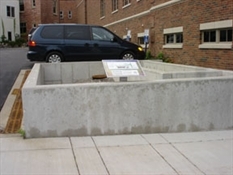 When the Watershed Council moved its office to downtown Petoskey, Michigan, we were determined to "walk our talk" and create a model stormwater management system at our new location. Each one of these techniques plays an important part in managing stormwater from our facility to help keep Little Traverse Bay clean. If you would like to learn more about any of these stormwater management systems, contact Tip of the Mitt Watershed Council at (231) 347-1181 and ask for the Watershed Protection Team.